If you are a Tory supporter, this week's polls make for grim reading. Following Survation - the only pollster whose findings should be taken with more than a pitch of salt - all the rest are posting leads for Labour of between one and nine (nine!) points. Things look especially catastrophic in the latest offering for YouGov on voting intentions in the European elections. As noted in discussing the Newport by-election, second order elections (all elections that aren't a general election, basically) tend to a flatter results profile as different issues and, in some cases, different electoral systems are in play. The common outcome are more potent challenges from fringe parties that depresses the share of the two main parties. With that caveat in mind, YouGov puts Labour on 24%, which is the same achieved by the party back in 2014. The Tories are on 16%(! ), with Nigel Farage's Brexit Party on 15%, and UKIP on 14%. The Liberal Democrats, Greens and CHUKa bring up the also-ran rear on eight, eight, and seven per cent respectively. Looking at the right-of-centre vote, you could get high snorting the fumes of decomposition. Nevertheless, there will be Tories taking some comfort from this. Your Boris Johnsons, your Jacob Rees-Moggs and Mark "Killer" Francois are going to feel intensely relaxed about it all. The idea members are going to sit on their hands and, in the privacy of the polling booth, tick the box for Nigel Farage or UKIP won't perturb them. Indeed, for a mindset befuddled by stupid empiricism, YouGov's poll is going to have been received with some delight. It's simple. Add together the Tories' own 16%, Farage's 15%, and UKIP's 14% and you get 45% of the vote! To weld them all together into a formidable electoral juggernaut to see off Labour and all the others, the necessary thing to do is copy Jeremy Corbyn in reverse and take the Conservative Party to the right. And before you can mutter some meaningless Latin, electoral fortunes are renewed and another extended period of government is granted. There is some precedence for this: the 2017 general election. May's programme was hard Brexit plus social authoritarianism plus anti-immigration, and some nice heart-warming words about one nation Toryism and bringing the country together. For her pains, and her campaign was painful, the Tories got their highest number of votes since 1992 and polled on a par with Margaret Thatcher in 1979 and 1987. And May was able to pull it off because she triangulated the Tory position to call back those UKIP voters, helped in no small part by a collapsing kipper organisation that stood down in seats where Tory MPs and candidates were deemed Brexity enough. Just imagine how much better they would have done if it wasn't for the dementia tax debacle, and the robotic strong-and-stable silliness - this is the vision for right wing Toryism. The bad European polling is just a hiccup before a new leader from the right can sort things out. Thankfully, the solution to the Tories' woes aren't so straightforward. By tacking right, May ramped up the fear of a Conservative government which contributed to a soft polarisation of the political parties, a situation Corbyn's Labour was able to capitalise on because it spoke to the interests and concerns of those the Tories had locked out of politics. If a right wing successor tries the same trick, and they will be incentivised to do so because of its proven record of drawing a viable voter coalition together, then it's bound to firm up the Labour vote in England and Wales, and possibly the SNP in Scotland. The second problem a new right wing leader's going to face is the betrayal narrative. 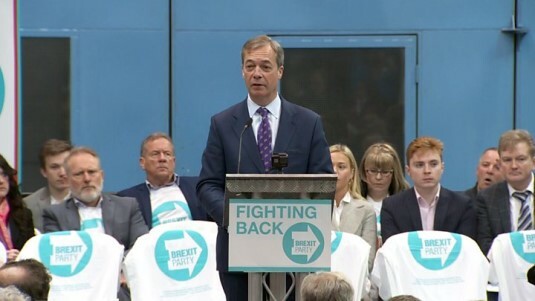 From nowhere, Farage's Brexit Party is outdoing UKIP in the polls, the large majority of whom are former Tory voters (how long are we going to have to wait before we hear Farage's vanity vehicle poses Labour a special and unique threat?). Some are going to be lured back to the Tories a la 2017, but having been fooled once by May are they going to trust the Tories again? A significant number are going to be very weary. And the same can be said for those who are about to punt for UKIP too. One cannot assume a Johnson, or a Gove, or a Mordaunt or whoever-led party can count on them again. Want more problems? During the Brexit process the Tory MPs have lived up to their 'stupid party' moniker by chasing every phony pony that canters past. The truth of the matter is there are some UKIP/Brexit Party voters who are going to vote for other parties in a general election instead. Going from memory, about a fifth of kippers came back to Labour in 2017. They might care about Brexit, but they know who forms the government matters more. And worst of all, not all of that 16% projected to stick with the Tories are voters in the bag. Going hard right could cleave into BP/UKIP, but at the price of losing moderate-leaning votes. This is where the ludicrous CHUKa outfit could become a rallying point for a new centre right, socially liberal party. Then again, none of its participants are noted for their keen political sense, so they can't be relied upon to play their cards well. What the Tories reaching to their right would accomplish is something somewhat less than 45% of the vote. It would produce a mass coalition comprised of millions of people, but with added toxicity is guaranteed to reproduce a declining bloc. In a turn out game they could muster enough to push themselves over the line, especially if the opposition is divided, but again a hard right Tory party would likely firm up the opposition. Job done, then? An ugly party with an ageing voter base that isn't reproducing itself, that's good news, right? Yes. A permanently unelectable Tory party is a good thing. However, there is a price to be paid. By turning right, the Tories would reinforce mainstreamed far right ideas, put rocket boosters under the betrayal narrative, and give confidence to every two-bit racist and fash. If Labour gets into government, whether as a minority or not, this would go into overdrive. And who suffers? Those people who, now, are on the receiving end of abuse and violence - LGBT people, Muslims, the disabled. The slow passing of the Tory party is an agonising process, but the worst part is it will lash out, causing unnecessary suffering and damage in death as it has done in life. I agree with the diagnosis of the electoral consequences. Especially the potential for a recomposition of a new rightist bloc in the wake of a disintegrating Conservative party. The possibilities this opens for Labour all depends, however, on the continuing integrity of the FPP Parliamentary system. Is the current discombobulation simply a temporary state of affairs, with will pass and be succeeded by business as usual? With that in mind you could see the emergence of a radical right wing party, dedicated to ending the current constitutional state. In Europe the existence of quasi-proportional systems seems to be leading to fragmentation, as the old two class electorate blocs come apart. In the UK, Scotland excepted, the FPP system will give power to whatever party keeps its internal coalition of electoral interests together best. I guess this then depends, for Labour, on its prospects for managing a reform programme in government, and on the attendant circumstances within which that unfolds. I think there is an element of boosterism and confirmation bias here. If May simply does what she has done all along, and makes a sharp right turn to call an election on the basis of a managed no deal Brexit, or alternatively, if she's replaced by Bojo/Gove/Raab the UKIP/Brexit Part vote, which is probably being flattered anyway (certainly flattered by the media that once again is rushing to give air time to Farage, Batten and Co) will dissipate like smoke, giving the Tories a clear lead. If you take the Green, Liberal, Small Change votes separately, you can present them as also rans on 8% each, but combined their vote share is as big as Labour's. Also, you have not included the vote share of Plaid, or most notably the SNP. In Scotland, Labour is likely to get wiped out as the Leave and remain votes get divied up between the Tories and SNP. The same on a smaller scale is likely in Wales, as Plaid also does deals with the other Remain supporting parties. There is ever reason, certainly in the EP elections that the Remain parties will produce combined lists, squeezing Labour's vote, as Remain supporters move to those parties in opposition to Labour's Brexit stance, whilst that stance fails to win it any Leave voters, as Richard Corbett has pointed out. Corbyn undoubtedly does not want to fight the EP elections, which is why he has engaged in his class collaborationist venture with May to stitch up a deal over the heads of Labour members and supporters. In the elections, he will either have to come out openly as a Brexiteer, which will split the party, or he will have to ditch his reactionary support for Brexit. Continuing the mindless annoying mantra about wanting an impossible "Jobs First Brexit" will no longer wash. If Labour loses out to an alliance of Remain supporting parties, whilst the Tories adopt a core vote strategy, Labour will get squeezed mercilessly. It will give the Blair-rights the road back they have desperately sought for three years, and mean all of the dynamic and momentum is behind them, and against Corbyn. Tories aren't going to die off. There is always going to be a space for a centre right party in British politics. Night and the Tories always return. well this is nuts, in common with lots of others. Since when have the political opinions of Tony Benn, Barbara Castle, and Peter Shore been 'hard right'? The idea that becoming part of a federal europe in hoc to big business is left wing is patently absurd, but Labour folks keep regurgitating it. Oh, I'd forgotten, you're going to reform the EU aren't you. In a large herd of Unicorns, reform of the EU is the biggest one of them all. The Tories need to break the association of Brexit with hard right, by being optimistic and showing how it can be made to work for the ordinary UK population. And don't start all this'but it can't'. Craven desperate defeatist pleading ones own powerlessness is embarrassing when others do it and downright humiliating when your own side does it. Just don't even start. "There is always going to be a space for a centre right party in British politics." Except the Tory Party are not a centre-right party. In the 1950's and 60's, and much of the 70's, they were a centre-right party, because their conservative social-democratic wing was dominant. Even under Thatcher that was mostly the case. She expanded the state and welfarism significantly, it was she that fought for the single market in the EU etc. But, today, the Tories are dominated by their reactionary wing that actually wants to turn the clock back and overthrow all of those things that the Tory Party believed in for much of the 20th century. Even at the start of the 20th century, remember it was Neville Chamberlain, who as Chancellor in the 1920's, brought forward all of the ideas for creating a welfare state, that were picked up by Beveridge later, and then implemented by Attlee. Its necessary to understand exactly which class fraction it is that the Tories now represent. It is that class fraction of 5 million small capitalists and their families, and retainers. It is the small capitalist "white van man", the "Del Boy" market traders, and so on, whose economic condition is often itself precarious, and those slightly above them, whose social circle overlaps. It is a class fraction based upon the ideas of militant individualism, and free market, dog eat do competition. Given that all together there are perhaps 12-15 million people in that class fraction, which forms the base of the Tory Party, they certainly not going away, and capitalism reproduces this class fraction by its very operation. But, it is not a class fraction that is looking any longer for a party of the centre-right, which is why the Tories will no longer occupy such a position.